Is there a better alternative to LiveWorship? Is LiveWorship really the best app in Religion category? Will LiveWorship work good on macOS 10.13.4? LiveWorship is a powerful church presentation software. It puts the power of enhanced worship presentation in your hands. LiveWorship's graphical interface is simple, yet powerful. It's as easy as drag, drop and Worship! It's non-linear control uses slide thumbnail images that display with one click. A powerful database keeps all of your song lyrics, backgrounds, Bible translations, video, and music at the touch of your fingertips. 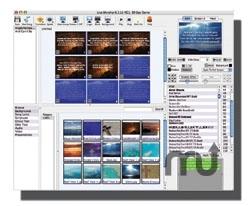 LiveWorship allows church volunteers to build presentations in minutes. You can edit presentations "on-the-fly" so you never have to interrupt your presentation to add slides, change slides, fonts, backgrounds, and more. LiveWorship comes loaded with popular Bible translations like the NIV, NRSV, KJV, the Message and many others so you can reach your church in compelling ways! Technology should never be a distraction to worship. Let LiveWorship move you beyond the technology!